I have 4 bags of goodies to give out tomorrow. 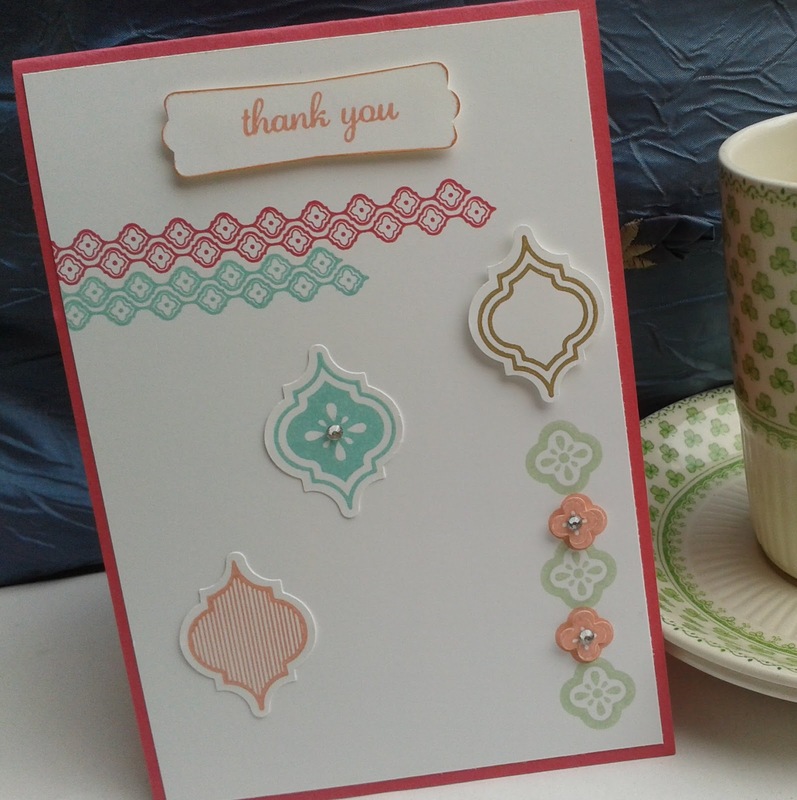 The orders from my 'at home' party last week. In the parcel I had ordered the Wildflower Meadow. 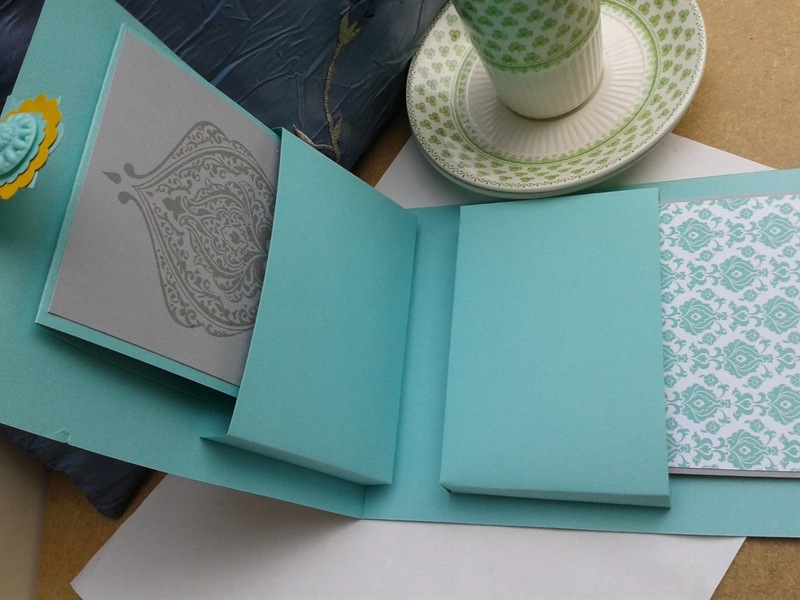 So something simple to sus the folder and stamp set out. I love the In Colours. So one card in each. I have also used the In Colour ribbon which is just fab. Stretchy and ruffled. 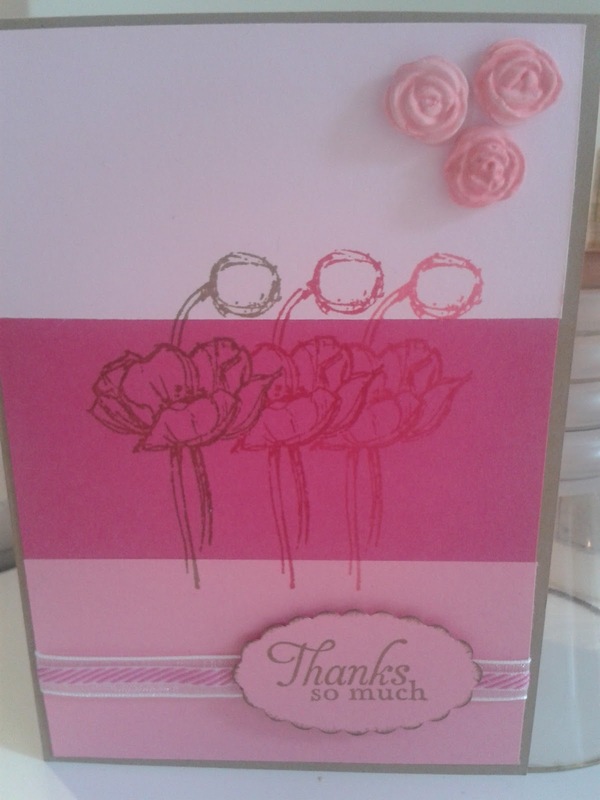 I think they make lovely 'thank you' cards. 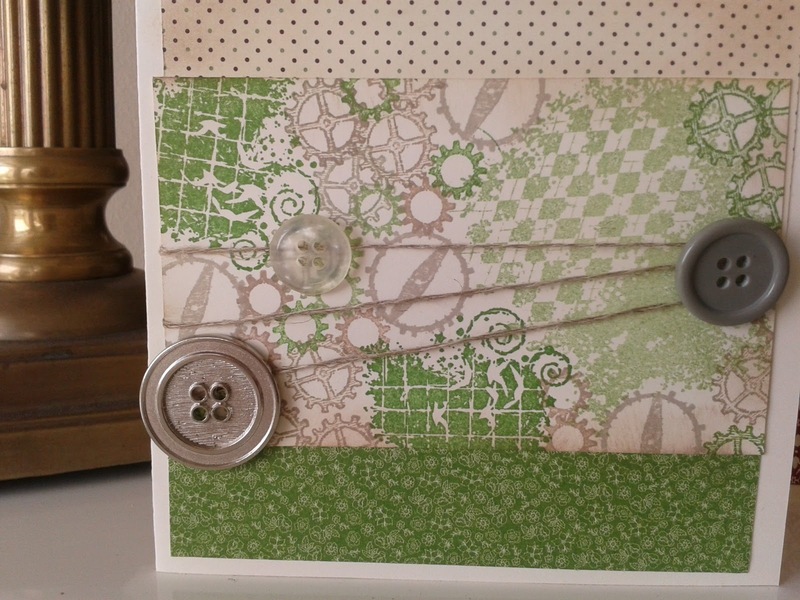 This stamp set remains one of my favorites. 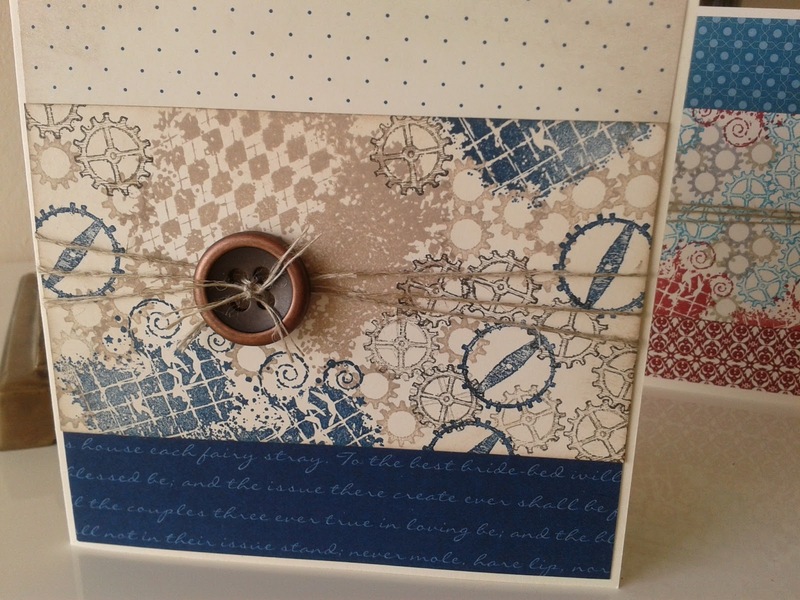 Here I have not only made a card but also a decorated box. These new boxes with the see through sleeve are really good. You could go so over the top with decoration and tags. 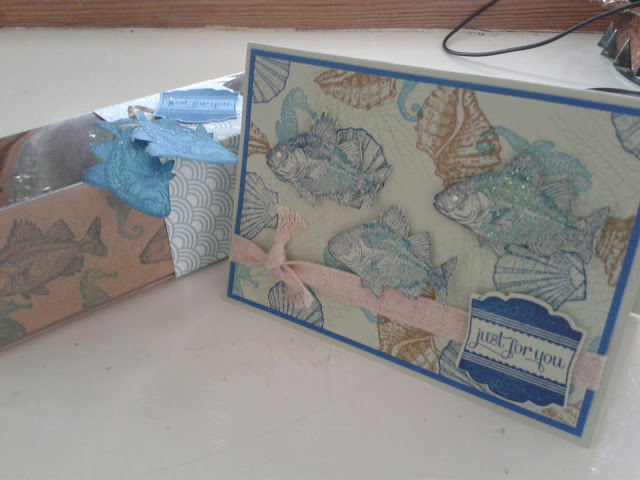 As this has a male theme I have just stamped 2 fish and cut them out. They do have a coat of shimmer! 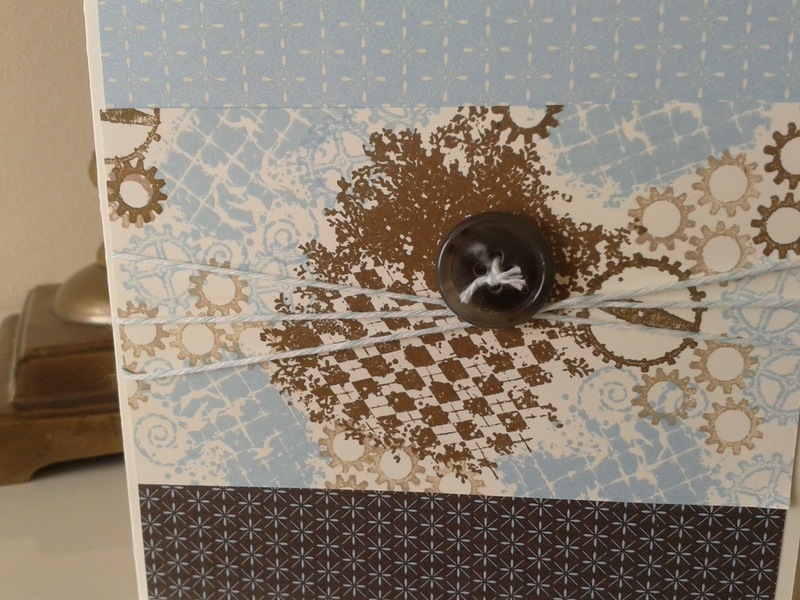 I have used the linen thread to attach them which seemed appropriate. What would you suggest as a gift to go into the box for a friend that fishes? 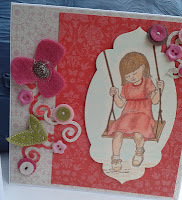 Went to craft club last Wednesday evening . One of the cards used this set which I hadn't even taken out of the box! 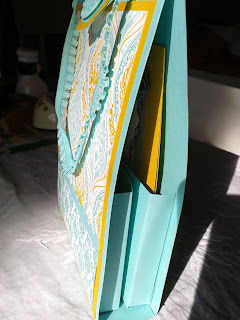 It inspired me to use some paper out of my bits box. I really enjoyed stamping these. Must do more of this sort. Can't decide which one I like best. I had my first party on Tuesday night. I took an idea from. the Inspirations magazine. 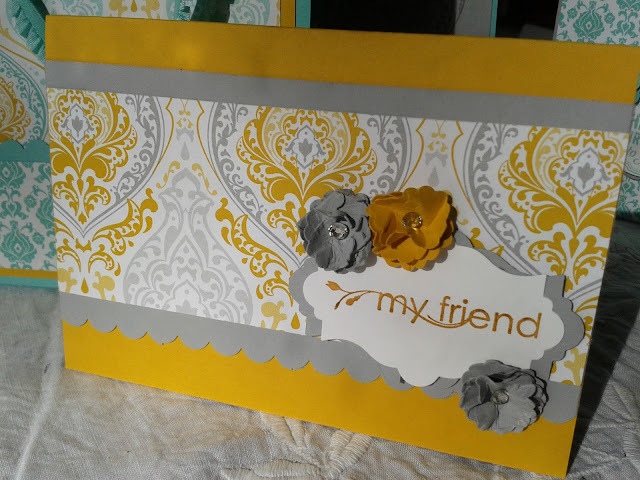 This is what my friends made. Many of them had not crafted before and thought that they wouldn't be able to do it. All were really pleased with their results. 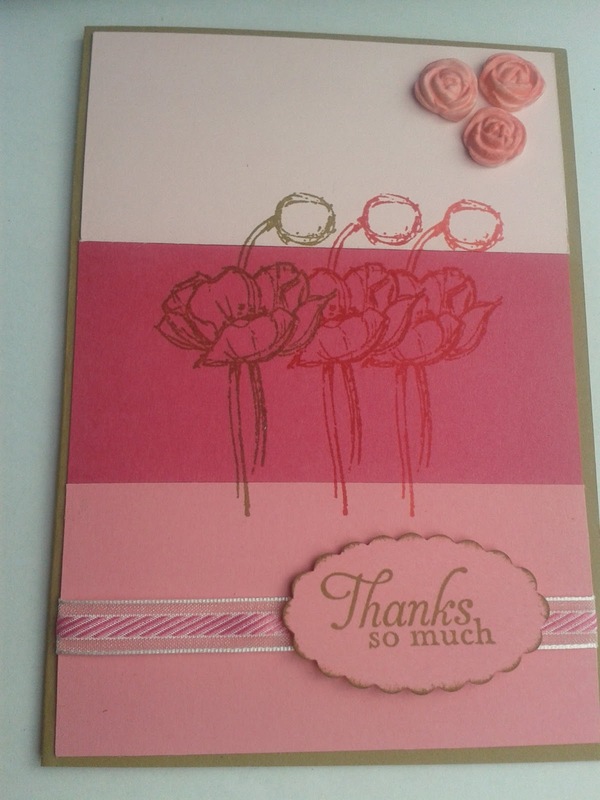 One commented that it was really quite therapeutic as she curled her petals! 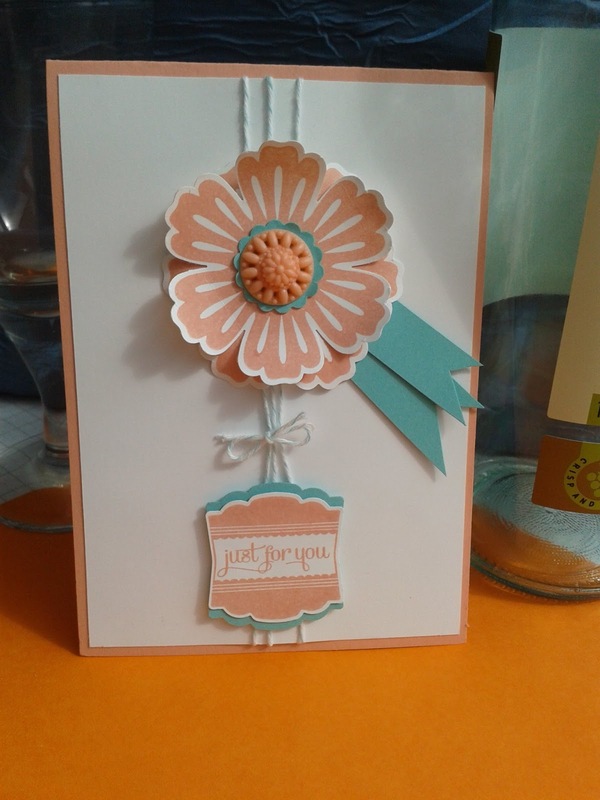 Card: Crisp Cantaloupe, Coastal Cabana, Whisper White. 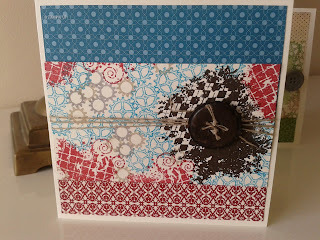 Stamps: Mixed Bunch, Label Love. Punch: Blossom Punch, Artisan Label, 7/8 Scallop Circle Punch. Other: Bakers Twine. 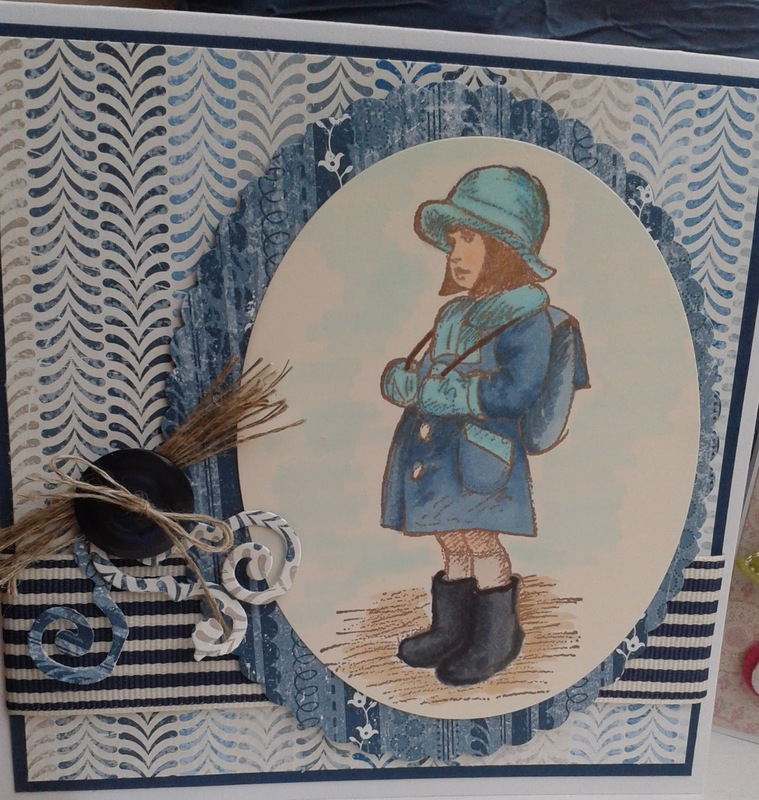 In Colour Embellishments. Now for the cards we made to go in the bag. 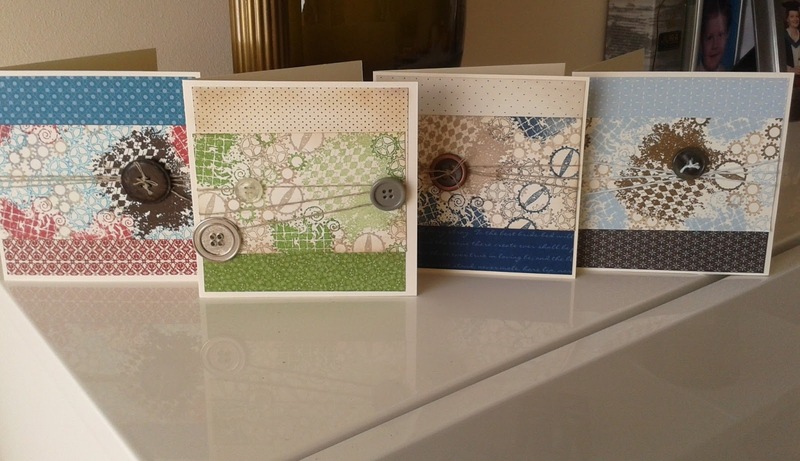 Here are the 3 we made at training and tomorrow I will share the other 3 I have made. 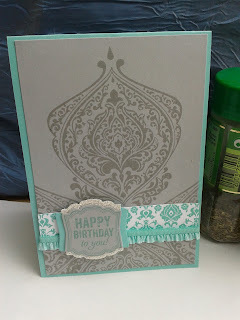 We used Eastern Elegance DSP, Crushed Curry, Smokey Slate and Coastal Cabana card and inks. 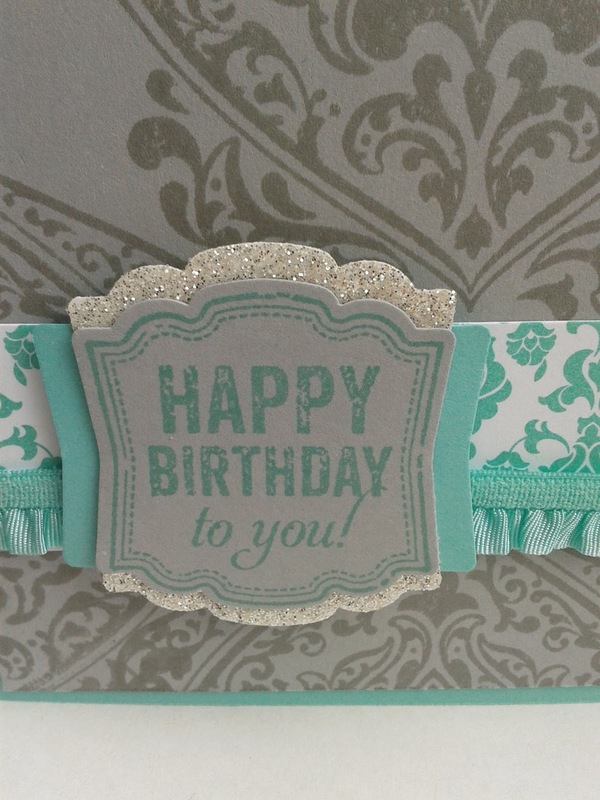 Silver glitter paper adds a bit of sparkle. The new Artisan Label punch and Label Love stamp set make layering card and glitter paper really easy. 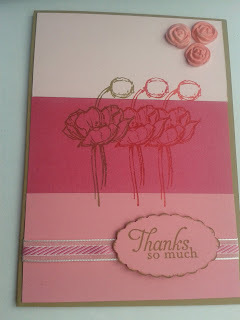 The flowers were made using the 7/8th scallop circle punch. Punch 3 then paint with water and scrunch. When dry un-scrunch a little and stick the 3 layers together. 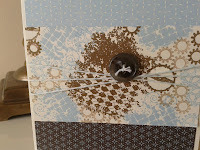 I have added a rhinestone to the centre of each.. This has very quickly become many peoples favorite. 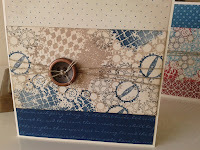 Its a good set as there are co-ordinating DSP's punches, stamps and embossing folders. 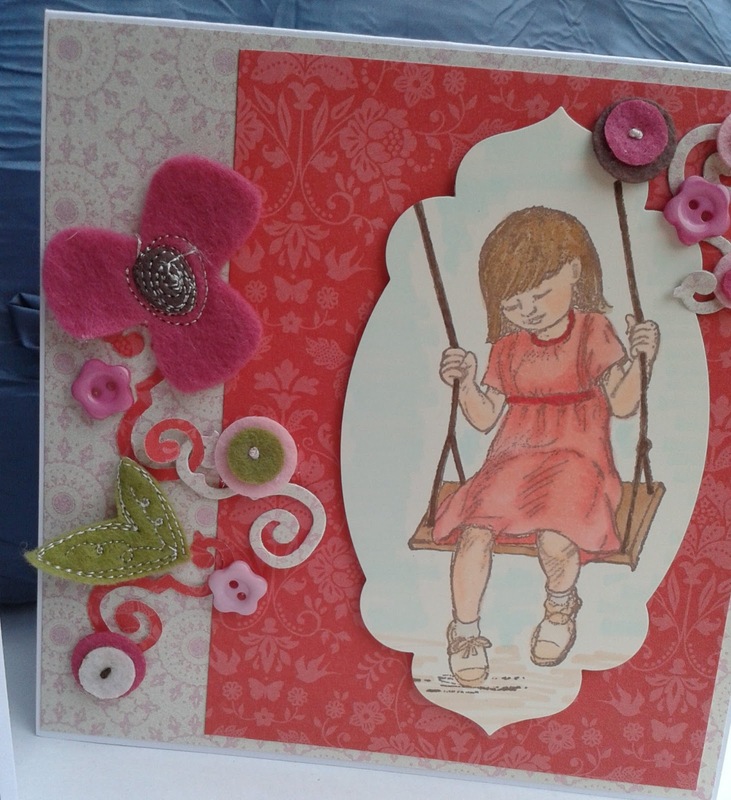 With a dash of imagination you can create loads of different cards and decorations. 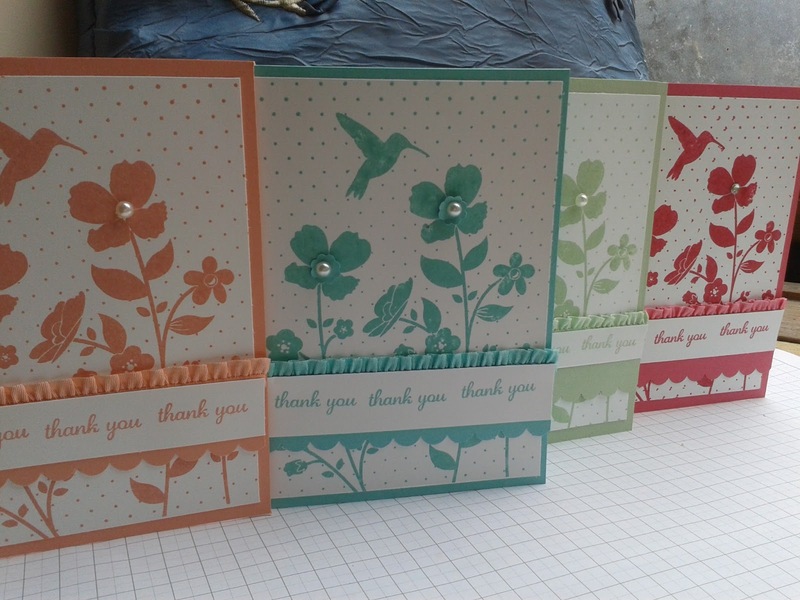 This is part of my starter collection of cards. 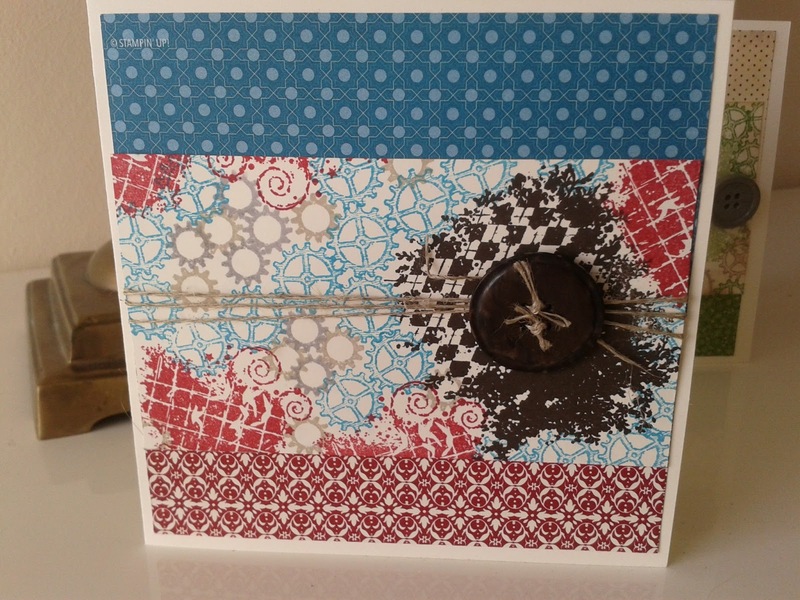 This first card uses the stamps and the punches. I have added a bit of bling just to lift it. The second card uses the embossing folder, stamps and punch. 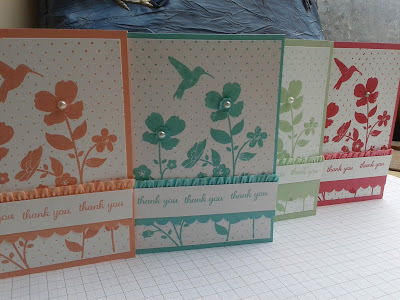 All are stamped using the new' in colours', which I really love. This is what we made at training. Isn't it lovely. 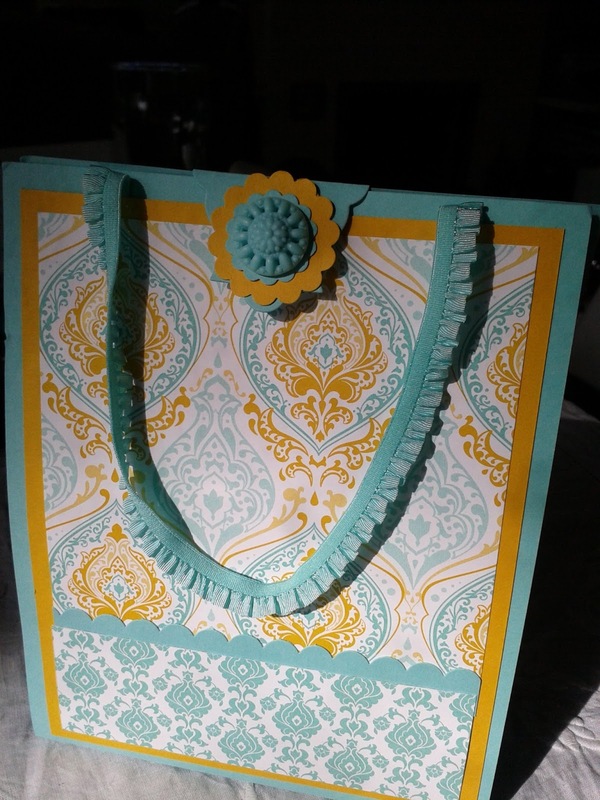 The bag is made in the Coastal Cabana and Crushed Curry card and the Eastern Elegance designer series papers, (DSP).Just a really vibrant combination of colours. 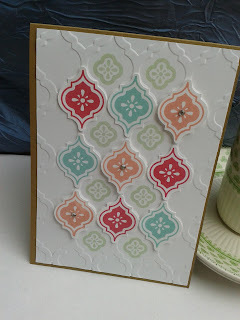 The fastening has a velcro dot underneath but an 'In colour' boutique detail on the top of punched scallop circles. Really effective.. The handles use the 'In Colour' ruffle stretch trim. I will show you the cards we made to go in the bag another time. Yesterday was team training for Julies Jems. We had a great day. Our project make was lovely and I finished mine and its contents last night when I got home. I will share that tomorrow. Today I have my swap. 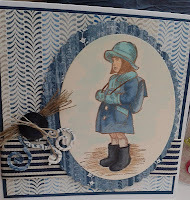 I have used the Wetlands stamp set. 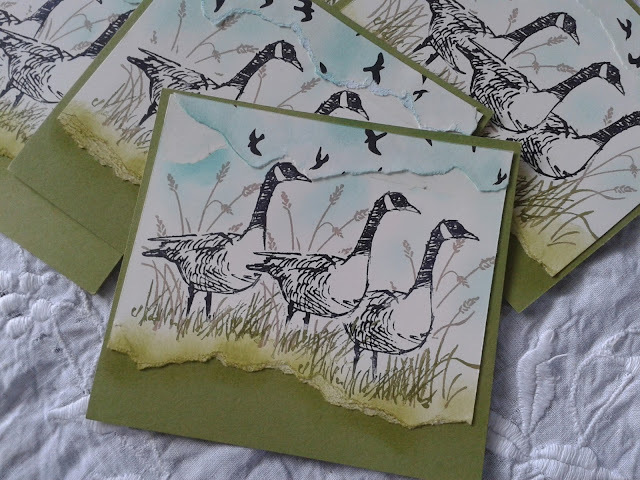 I love the geese they remind me of our year travelling the canals of England. I have to say they were very noisy neighbors. 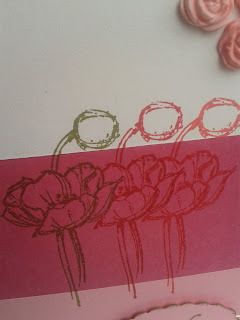 These stamps are part of one of the lovely sets you can buy at a reduced cost if you host a party. There is a brilliant choice of sets this season for hosting a party, I would like them all!. 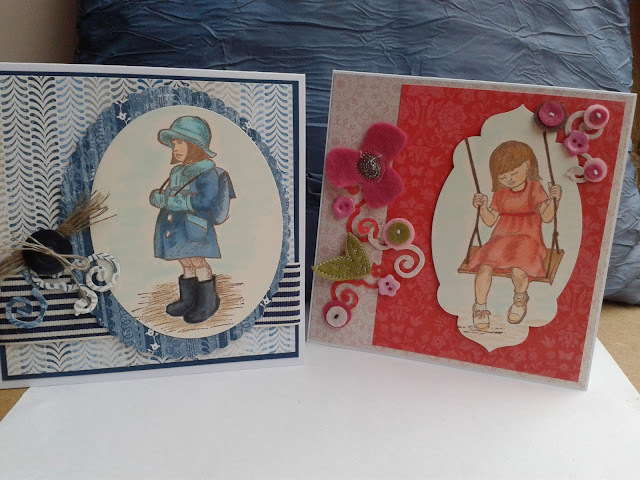 Its been a busy day in the craft room as it has rained most of the day. Coming down quite heavily now. Class next Monday is now all prepared and ready to go. Last week whilst out shopping I saw two stamps reduced to 99p. 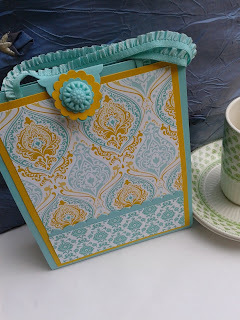 I don't usually go for these things as SU products are so brilliant but these two just beckoned and they are quite different to what I usually like. Anyway here is their first outing. 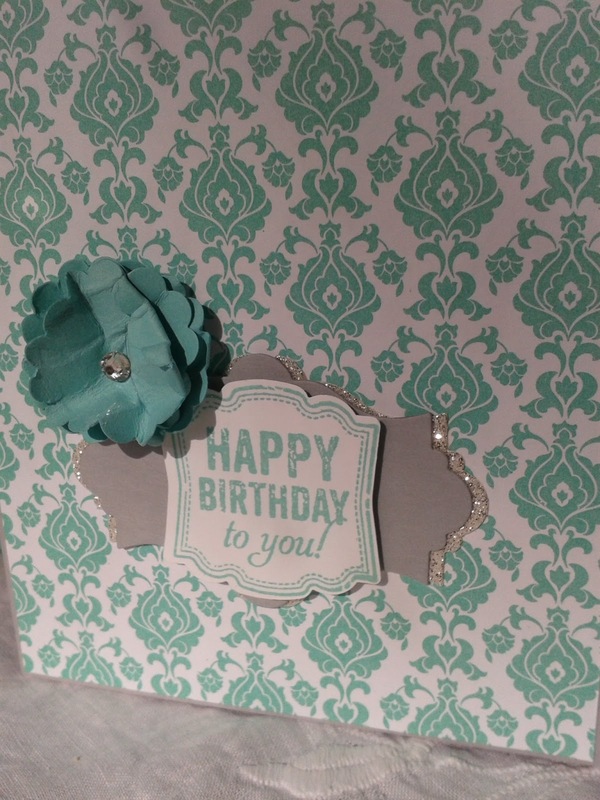 How many Stampin' Up products can you spot? I think they may get another outing sometime. I really enjoyed the shading, so therapeutic.